CARANDA Super Heavy Duty® batteries use separators with fiberglass mat “glassmat” combined with specially reinforced plates. Due to these special separators, the lifespan cycles are longer and the vibration resistance is higher than conventional batteries. The trucks and the semi-trailer trucks that cover long distances daily require a battery that provide total performance. Only batteries with extra power and durability can meet the power requirements of the devices embedded in such vehicles, such as navigation units, TV, DVD etc. Moreover, these vehicles require a battery that provide high startup power for a problem free start after long pauses. Long distances, the use of electric devices during breaks, irregular charge and discharge periods are handled only with long battery life cycle. 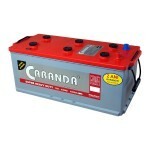 Baterie camioane 150Ah 1000A - CARANDA SUPER Heavy Duty. Acumulator fara intretinere pentru camioane, utilaje industriale, utilaje agricole.